A few days ago, I shared a photo of the newly built shelving unit I bought to store all of my food props. When I saw that my local grocery store had put some of their seasonal items on sale in preparation for Easter, I was, naturally, tempted to buy some. 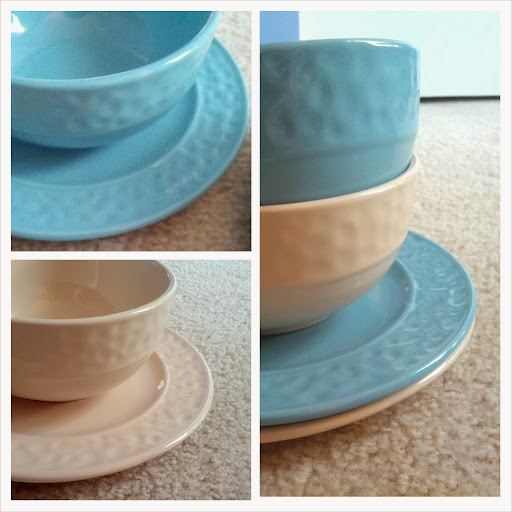 I resisted the brightly patterned dishes and went with neutral colors so I could use the dishes all year round, and snapping some quick pictures, I promptly put the dishes away with the rest of my props. And, speaking of "everything in its place," I also started emptying out my extremely full inbox by unsubscribing from newsletters and mailing lists and sending out replies to people who've been patiently (or not so patiently) waiting to hear from me. That's when I noticed that there were a lot of emails from me in my inbox. You see, even though I have a Pinterest account, I've found that it's a lot easier for me to keep track of the recipes I want to try by emailing them to myself to review later. When I was growing up, my parents didn't entertain too often, but when they did, my mother had her go-to appetizers that she'd serve to our guests. Her peanut butter-stuffed dates rolled in sugar (!) were really popular with everyone, and people learned quickly that they had to get to the platter of dates toward the beginning of the party if they were going to have any at all. Although, my mother's appetizers didn't call for dates, these Bacon-Wrapped Dates from The Kitchn reminded me of the afternoons I spent in the kitchen with my mother, helping her get all of the party food ready. This recipe for Chocolate Cake with Kahlua Chip Frosting from Baked Bree is a few months old, but I think some of you might appreciate seeing it in case you're already trying to figure out what to bring to Easter dinner. In my opinion, chocolate cake is always an acceptable contribution! This Cinnamon Roll Bread from CenterCutCook would make another great addition to a Sunday brunch table or maybe even an afternoon get-together with the girls. I think it's really telling that I gravitated to a bunch of brunch-appropriate recipes over the past few weeks. Perhaps Stephen and I need to plan host friends to brunch at our place one weekend soon? To prove that I have more than breakfast/brunch on the brain, here's a delicious-sounding recipe for Crab Cakes with Ginger and Lime from Simply Recipes. Don't be surprised if you see these crab cakes on one of our weekly Menu Plans in the near future!